Christopher’s and Donegal played an entertaining hour of football, with Christopher’s erasing a Donegal lead in the second half, only to see the northerners finish the game strong with a late 1-4 salvo. It was a much improved outing for Christopher’s, and Donegal look like they have an Arsenal of weapons with which they will cause some damage in this year’s championship. Christopher’s first half performance was a far cry from their first outing of the season. A much improved forward line and a defence that worked hard to force Donegal into taking poor shots saw Christopher’s into a 0-6 to 0-3 lead approaching half time. John Campbell (2) and Gavin Gallagher had opened the scoring before Christopher’s put five unanswered over the bar. Center forward, Danny Neville, was the marksman with three, while Cathal Finucane and Kevin Hodgins chipped in with one each. Christopher’s were looking good. Donegal however, finished strong as they found a way past the Christopher’s defenders, Alan McLaughlin, Campbell, and Eoin O’Connor tied it up before the break. Donegal opened the second half with three quick points. Christopher’s had just missed a chance when Coyle, Rory Dunleavy and Brian Donnelly put hard earned scores over the bar. John Campbell proved instrumental in a goal as after winning the diagonal ball into his corner, rounded his man and dished to the inrushing Dunleavy, who netted from inside the 21. Less than 10 minutes gone after the restart and Christopher’s had their backs to the wall. Donegal looked like they had the better of things, attacking in numbers and with Campbell in the corner a dangerous target man. Campbell and Coyle pointed, but Christopher’s answered with two from Cormac Collins before their own target man, Dan Kenneally tipped a high ball from brother Paudie into the net. The target man worked to great effect soon afterwards as another high ball into the box from Neville resulted in a penalty after Kenneally was held, and Collins put the kick away. One point game. Donegal had too many front line weapons however. With Lee Carr, Neville, Campbell, and Neville firing on all cylinders the Tir Chonaill men dashed Christopher’s hopes with a six point salvo to finish the game. A Lee Carr goal was accompanied by three points, and in the space of a few minutes it was a seven point gap. Donegal looking strong, and getting even better, while some encouragement to be had from Christopher’s. Donegal: C. Mclaughlin, D. Monaghan, C. Russell, G. Gallagher, D. Green, R. Dunleavy, S. McMenamin, B. Donnelly, V. Coyle, E. O’Connor, A. McLaughlin, J. Campbell, L. Carr. Christopher’s: R. Lavelle, D. Kelliher, P. Allen, B. Deasy, J. Horgan, S. O’Riordan, C. O’Brien, J. Kenneally, C. Finucane, D. Neville, C. Collins, D. Kenneally, K. Hodgins. Connacht Ladies drew first blood in the Ladies Senior Football championship with a victory over a battling Tir na nOg team. Center forward, Aisling Reynolds was the center of their forward activities, while the back line held up when pressured by the Brighton side. It was a victory soured by a serious injury to Maria Kelly who had to be brought to the hospital for treatment. Two first half goals put Connacht Ladies in the driver’s seat. Aisling Reynolds was instrumental of much of the positive things happening for the westerners. At wing forward Reynolds finished a lovely move to net and put the Westerners into a four point lead. Tir na nOg had got off to the better start with points from Danielle Pugh, Emma Connolly, and Niamh Daly, Daly pointing from a very tight angle. The Brighton team were moving the ball well and seemed to have found an early groove. Connacht ladies came back into the game in a big way, however, Reynolds popped over three frees in a row as the Tir na nOg back line were forced into fouls. Then came the goal, and was soon followed by a second from Maria Kelly. The defending champions were looking good and the back line tightened things up, with Honor Ennis at corner back working hard. Niamh Brick stemmed the Connacht tide just before the break with a well worked point, and at the break Connacht held a 2-5 to 0-4 lead. Tir na nOg started the second period well, and early on we inside on three occasions as the spaces behind the opponents rearguard started to open up. Caroline Nee first blazed a low shot past the far post, then Niamh Crowe was in and her shot was saved by Jackie McDonagh. The rebound was put over the bar by Crowe, and finally Nee was put in and finished her shot into the back of the net. After the flurry the Connacht Ladies lead had been reduced to two points. Play was stopped for a lengthy period following an injury to Maria Kelly for whom an ambulance was required. Following the stoppage Connacht ladies restored their advantage with a goal and a point from Reynolds. There were good saves at either end from McDonagh and Niamh Hynes before Roisin Boyce made it a three score game with a point. Tir na nOg had it all to do to pull it out of the bag. Connacht Ladies, however, maintained the advantage and really should have added to the tally, however some wayward shooting meant that the door was left open. Trudi McLaughlin reduced the deficit to the two goals with a few minutes left, and Tir na nOg tried to work the ball into the danger zone for a goal, however, with Jane Ward helping out in the back line Connacht Ladies held firm. Tir na nOg: N. Hynes, M. Sayers, R. Stapleton, C. Murphy, N. Daly, A. McKenna, M. Murphy, E. Connolly, D. Pugh, C. Dalton, C. Nee, T. McLaughlin, N. Brick, A. Leady, M. Mullan. Connacht: J. McDonagh, H. Kilgallon, H. Ennis, A. Kerr, S. Cleary, A. Sheridan, C. Boyle, R. Boyce, M. Other, A. Finnerty, A. Reynolds, R. McElligott, J. Ward, N. Crowe, C. Ryan. 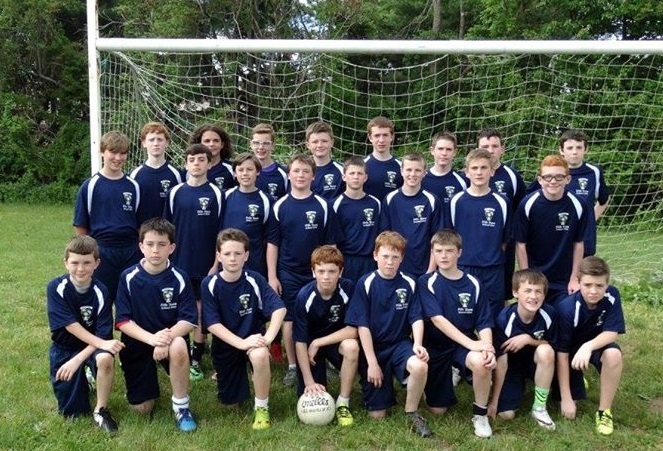 Excitement is building on both sides of the Atlantic as 24 local boys are bound for Ireland next week to compete in the annual Feile na nGael. Kids and parents, and relatives in Ireland alike, are keyed up for what will be a trip of a lifetime. The kids have the unique opportunity to play Gaelic football on Irish soil against Irish teams, an experience that will stay with the players for a long time. It is the first time that a team from Boston has traveled to play in the famous competition for age Under-14 players since 2008. The players have been practicing since last October under the watchful eyes of Martin Kerr, Noel Gannon, Paddy McCusker and Pat O’Malley. 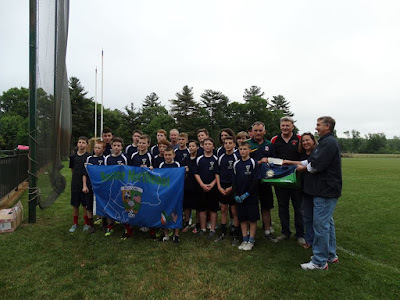 Players from all 3 of the Boston area underage clubs have been joined by players based in Springfield and Portland Maine, who have made the multi-hour journey from Western Mass. and Maine to attend the practice sessions and challenge games. Ballymacelligott, just outside Tralee in County Kerry, is the host club, and word is that a lot of preparation has been underway. The Boston boys will be paired up and will spend 2 nights of the trip with a host family in Kerry. Needless to say, the players involved are excited as well as nervous with the prospect of playing in Ireland against local kids and Warwickshire who are traveling from England. The hope is that this group of players will be the first of an annual trip to the competition from Boston and that the experience these kids have will be one that other Boston and New England area kids will have. On Friday June 24 the team plays Warwickshire at Ballumacelligott at 5:45, followed by a game against Kerry team, Athea at 6:30. It is back at it on Saturday at 9:45 in the morning against Limerick. Quarter finals are at 2:00 Saturday afternoon, with semi-finals and final on Sunday. Presentation of kitbags by Dermot Quinn of Greenhills Bakery. A person who deserves special mention, and without whom this endeavor would not have been possible, is Laura Corbin. Laura has been tireless in organizing fundraising activities, setting up and updating the Facebook page, and being the primary point person for the folks in Ireland and the parents involved on this side of the Atlantic with updates and information. Everybody involved would like to thank all of our sponsors, including the Greenhills Bakery and Feeney Brothers who sponsored kit bags and jerseys, and the many people who have supported fundraising efforts over the last several months. The players traveling are: ISYL - Lawrence Byrne, Devin Corbin, Aidan Flanagan, Gerard Gannon, Michael Kerr, Conan McCusker, Eoin Morissey, Patrick Moylan, Dylan Murtagh, James Newell, Colm O’Malley, Aidan O’Malley, Eoin Walsh. Wolfe Tones, Springfield - Cathal Carney, Neil O’Sullivan. Trinity Milton – Eoin Faherty, Colm Faherty, Darragh Jordan, Nessan O’Donnell, Aidan Skillen. St. Brendan’s – Kian Hanbury, Sean Hobbs, James O’Neill. Maine – Frank Tierney. Another exciting senior hurling match was played between Wexford and Tipperary, with Wexford just about pulling off a one point victory. Brendan Phelan was tremendous for Wexford at center back, while Shane Ryan was key in the forward line. It was hearts in mouths all the way to the final whistle as Wexford managed to get their noses ahead in the final minutes, and repelled the defending champions’ late attacks to see themselves over the line. Rory Sludds looks to get the ball in hand. A Tipp goal was the difference between the teams at the break, it came from the stick of Mark Kavanagh half way through the period. The sides were level on four points each, Rory Sludds, Eoin Kavanagh, Shane Ryan and Jamie Kehoe the Wexford scorers. Tipperary’s marksmen were Jason Bergin, Liam Maloney, and Cronan Dempsey. Wexford absorbed the pressure playing against the stiff wind, and Brendan Phelan was a busy man at center back for the Slaneysiders. Tipp looked like they were building on the goal as the backs and midfielders sprayed the ball into the corner forwards with Kavanagh and Maloney capitalizing. Wexford finished the half well however, Shane Ryan did a good job from the frees for Wexford, and a late point from Kieran O’Dea left it a Tipp two point lead at the break, 1-8 to 0-9. Kevin McKiernan about to strike for Tipp. Wexford got the goal back through a Jason Bergin strike, a score that leveled the game. Wexford added two more points thereafter, both from Ryan, and Wexford were in the lead and with that wind. Things looked favourable for them. Tipp kept up the pressure, however. Mark Kavanagh moved to a half forward role from the corner and his ability to carry the ball helped Tipp greatly, as they had to against the wind. Tipp netted another goal, Cronan Dempsey got the better of Darragh O’Callaghan as both challenged for a high ball into the box from Moloney - the ball found the back of the net to put Tipp back into a one point lead. Wexford made use of the breeze, however, and their half backs did well under the hanging ball to gobble it up and send it back. Ryan converted two frees, and a third from play, and Eoin Kavanagh put a long range effort over from distance out on the wing. Tipp , though kept pace with scores from Moriarty, Kavanagh, and Colm Fitzgerald as the Premier men continued to work hard. With the game winding down it was even scores with Wexford 1-17 and Tipp 2-14. Wexford broke the deadlock with Conor Sheehan putting the go ahead score over the bar followed by another from a Ryan free. Tipp managed a late Bergin point from a free, but there was no time for another effort and Wexford get off the mark with two early championship points. Wexford: D. O’Callaghan, G. Murphy, J. McCarty, T. Maloney, B. Phelan, D. Guinan, J. Kehoe, C. Sheehan, E. Kavanagh, K. O’Dea, R. Sludds, S. Ryan, D. Walsh. Tipp: J. Maher, S. McGarr, C. Neville, J. White, S. Nally, A. Ryan, C. Dempsey, K. McKiernan, J. Bergin, P. Moriarty, L. Maloney, E. Moriarty, M. Kavanagh. The windy conditions did not make for a great game of football between the Tones and Galway, though Galway did make it exciting in the second half as they reined in what was an eight point lead to three. Playing with the wind the Tones banged in 4 first half goals as Galway struggled to cope with the conditions and their opponents, while in the second Galway reined the lead back to a single score only for Paddy Keenan to relieve the Tones nerves with a late goal. Galway's James Kennedy holds off Shea Tennyson's challenge. It was a tightly contested first half with Galway fighting against a stiff breeze as well as a physically strong Wolfe Tones. Galway looked to be making some inroads early in the game with Michael Daly and Fionn Ferguson opening up the Tones defence on a handful of occasions. Galway failed to capitalize, and it was the Tones who drew first blood against the run of play. Andy McDonnell took advantage of the open space in front of him and his low shot beat the keeper although his shot looked a little fluffed. Galway answered in kind immediately, Barry McHugh finished a well worked move to level matters again and it looked as though a game was on the cards. Galway added a point from Daly, but then it was the Tones who made hay for the rest of the half. Three more goals before half time had to have dampened Galway spirits. Shea Tennyson added a second after a good move involving McDonnell, and the third came from Gerry Troy who finished a move soccer style into the far corner. McDonnell netted his second and the Tones fourth with half time approaching and Galway wondering how to stop the deluge. Galway had spurned a handful of chances all through the half, but added a couple of points from Daly and Kevin Cummins just before the break to alleviate the pressure somewhat. At half time it was a 4-2 to 1-3 Tones lead. The Tones played smart in the second half to cope with the conditions, holding on to possession to make it easy on themselves against the breeze. Galway had taken two points off the lead with Eoin Finnerty and Daly scores, however two Dan McCabe strikes restored the lead. As time wore on Galway began to take advantage. Five unanswered points reduced the gap to a goal and with 10 minutes still left the Tones started to look anxious. Eoin Kavanagh had entered the action and broke a handful of balls to Galway’s advantage, while Daly was the fulcrum through which much of Galway’s scores came from. Daly, Cummins, Eoin Finnerty and Jason Lyons accounted for the Galway scores as Galway patiently chipped away at the lead. The Tones got back to the possession game, and after a couple of wayward efforts, a somewhat fortunate goal came their way. Paddy Keenan thought he had a penalty after being upended in the box, but after referee John Farren did not blow the whistle, Keenan’s shot was half blocked and looped into the back of the net and the Galway comeback was over. Six point game again and three minutes to go. The Tones saw it out to the final whistle with two points from substitute Liam Galligan, and are now two wins from two games. Galway: J. Kelly, G. McGoy, J. Kennedy, S. Cullen, J. Kehoe, C. Mannion, P. Naughton, M. Daly, F. Ferguson, K. Cummins, J. Lyons, E. Finnerty, B. McHugh. Tones: P. Miskell, R. Driscoll, D. Maguire, S. Driscoll, M. O’Grady, G. Brilly, I. Whelan, P. Keenan, M. O’Brien, A. McDonnell, G. Troy, S. Tennyson, D. McCabe. Donegal and the Blues shared the points after playing what was not a classic game of football, but was a very exciting second half in which the Blues were holding on desperately to an unlikely lead until the final minute. The Blues battled tooth and nail throughout and fully deserved to be in position to win the game, but it could well have been Donegal that walked away with full points had Christy McLaughlin’s long rage free with the last kick of the game not come off the post. put it in for 60 minutes. The first half was a close run affair with neither side managing to gain an upper hand or come to grips with the game. The Blues defended en-masse to afford little space for Donegal, and often the final ball from Donegal was disappointing. Options tended to disappear in the swarming Blues defence as, although the northerners tried to move the ball at speed, the openings did not present themselves. The Blues played on the break and the strategy worked for the opening period with the wind at their backs. Scores were at a premium; John Campbell, Alan McLaughlin, and Vinny Coyle accounted for Donegal’s first half points, while the Blues had Maurice Young and Brian Rayel to thank for theirs. At the half it was the Blues one to the good, five points to four. The Blues continued to work very hard in the second half and fought for every ball. They were rewarded for their efforts with a goal from Conor Fitzgerald. Fitzgerald gathered well on the edge of the square and slotted the ball into the far corner. The blues had used the ball well, pointing three times up to that stage. Denis McElligott, Young, and Dara O’Connor the scorers. The score put the Blues into a five point lead and a surprise Blues victory was very much on the cards. Rory Dunleavy on the ball for Donegal. The five point lead remained intact as Young and Brian Donnelly traded points, then free taker, Maurice Young, was black carded with 15 minutes to go. After Alan McLaughlin pointed for Donegal, Vinny Coyle found himself in acres of space and the goal at his mercy, and netted into the far corner from inside the 21 to the top corner. It was now a one point game with plenty of time left. The plot thickened soon afterwards when Brian Donnelly was shown a second yellow card but the man advantage did not last long when Cormac Coffee also saw red. It was to and fro for the last 10 minutes with the Blues holding out as Donegal tried to breach their defence one final time. Eventually John Campbell put the leveling score over after Donegal were awarded a free on the 21. There was one final chance for the Tir Chonaill men to take all of the spoils, but Christy McLaughlin’s long rage free with the last kick of the game came off the post and that was that. The Blues will have been disappointed not to have hung on, though their performance certainly is one to build on for the rest of the season. Blues: E. Whelan, S. Kelly, P. O’Sullivan, C. Killeen, D. McElligott, C. Coffee, D. Somers, D. O’Connor, M. Young, S. Moriarty, G. Bastible, C. Fitzgerald, B. Rayel. Donegal: C. Mclaughliin, D. Monagle, C. Russell, S. Doherty, D. Green, R. SDunleavy, S. McMenamin, B. Donnelly, P. Graham, E. O’Connor, V. Coyle, J. Campbell, A. McLaughlin. The junior A hurling championship opened with Offaly and Barley House Wolves meeting on a pleasantly breezy afternoon at the ICC. It was a first outing for Offaly who will likely prove to be a strong junior A side this year and for the all American side, Barley House Wolves, it was a step up as the New Hampshire based team competes at junior B in the North American competition. It was pretty much all Offaly and as the game wore on and Offaly found their touch the scores became more frequent. Barley House Wolves battled throughout the game and will have had some valuable match competition under their belts. The Boston Offaly club just before their first outing. The first half was pretty much all Offaly. With seasoned hurlers such as Andy McRedmond manning the center back position and Stephen Brown at corner forward, Offaly had the tools to cause considerable damage. Tommy Rigney at wing back featured prominently, as did James Kilmartin at wing forward. Early in the half Brown put three impressive points over the bar from a tight angle near the big stand, and the wily Mickey Markham chipped in with a couple of well taken scores. Offaly goalkeeper, Gary Sherlock was called into action to gather a dropping ball and did well to clear, and shortly afterwards his counterpart, John Mullen saved well from a Brown shot at goal. The Wolves worked at it with Steve Desjarlais and Michael Gregoire toiling in the half back line, while Pat Naughton and his forwards tried to make the most of the supply that came their way. Eventually the efforts of the Concord NH side were rewarded with a point from Sean Naughton. The scores continued to flow for Offaly as their shooting continued to sharpen as the half wore on. At the break it was an unassailable 16 points to one lead for the Faithful county. In the second half Offaly added a couple of goals to the tally, Lyndon Kiley and Brown the scorers. A great start to their maiden season for Offaly. Points from Sam Durfee and Pat Naughton added to the tally for the Barley House Wolves, and provided some encouragement that the New Hampshire boys eventually started to find the mark. Galway will provide the opposition for both teams in their next outings of the season. Offaly: G. Sherlock, J. Murray, A. Bergian, C. McDermott, A. McRedmond, T. Rigney, C. Mahon, R. Reynolds, L. Kiley, M. Markham, S. Brown, C. Flynn. BHW: J. Mullen, N. Always, A. Foley, J. Abramowitz, M. Gregoire, S. Desjarlais, S. Naughton, R. Nickerson, M. Mazorski, P. Naughton, S. Durfee, S. Emerton, M. Wilson. Next Sunday sees the debut of the newly formed Offaly Hurling Club who take on the Barley House Wolves in the first round of the junior hurling championship. It will be a great occasion for hurling in the region. The addition of Offaly, and of the new Providence Hurling club, brings the number of Hurling clubs in the New England region to 10. In many ways it is fitting that they meet the first of the regional clubs, the Barley House Wolves, whose unique story of comradeship and healing is well known. Best of luck to the new clubs in their maiden season, may it be the first of many. There are two senior hurling games on the card for Sunday also. Fr. Tom’s take on Galway in the first round. It is a long standing rivalry between the two clubs in this area, each having a traditional draw from Galway at home, and even having brothers in each separate camp. Tom’s had a fairly impressive first Sheehan Cup outing against Barley House Wolves, while for Galway it is the first outing of the season. Getting the early two points is important with settling a club for the rest of the season as nobody wants to be battling for third place in late July and August. Wexford meet Tipperary in the second game. Tipp are defending senior hurling champions and Cronan Dempsey and Co. will be looking to get off to a good start in their defence of the title. Tipperary have made some good additions to the forward line, Liam Moloney and Mark Kavanagh looked particulary good last week. Wexford have traditionally been strong on the home based front with the likes of Kilkenny men Eoghan Kavanagh and Tom Maloney serving the club well over the years, and have picked up some additional help with the addition of Rory Sludds and Dan Sweatland. Wexford just about had the upper hand in last week’s Sheehan Cup semi-final, and with championship points at stake Sunday a treat is surely in store for hurling fans. The Senior Football championship continues with Galway, who looked impressive in their first outing take on a Wolfe Tones club that have continued to beef up their home based ranks. Both teams are looking to add a second win. Kevin Cummins looked impressive form for Galway, and Meathman, Fionn Ferguson (nephew of the famous Terry Ferguson who played for Meath in the 1980’s and 90’s) looks to be a great addition to the forward line for the Brighton team. Wolfe Tones also had a solid win in their first game out. With Ian Whelan in the middle of the field, and Shea Tennyson and Jerry Troy in the forward line, as well as former Louth and International series footballer Paddy Keenan, the Tones will be hard to beat. The final game of the day sees Donegal face the Shannon Blues. Donegal looked powerful in their opening game. Louthman, Brian Donnelly, returns to the team for the season in the middle of the field and Buncrana native John Campbell at corner forward will prove to be a tough assignment for any corner back. The Blues will be looking to improve on their first outing where Galway handed them a loss. Corner forward Paudie McCormack proved to the main threat for the Blues, however they will be looking for ways to prevent Donegal from racking up an early tally as Galway did in the last game. Wexford, who fielded 2 American born players in their starting lineup, earned a place in the Sheehan Cup final after a close encounter with a good looking Tipperary side. The game ebbed and flowed and could have gone either way, but it was Wexford who finished with back to back points to seal the deal in the final minutes. Wexford and Tipp played a well contested game Sunday. The first 30 minutes were entertaining. There was some good hurling from both sides, and some well taken scores. Liam Moloney, lining out at center forward for Tipperary had a first half haul of 5 points from frees, while his Wexford counterpart, Shane Ryan accounted for three points from long range frees. Mark Kavanagh and Sean Nally looked strong for Tipperary at wing forward and midfield respectively - Kavanagh pointed well from out on the wing on two occasions - though Moloney was Tipps big dangerman when on the ball. Wexford were a match for their opponents and played the ball well. With the teams tied at 6 points each Dan Sweatland took advantage of a rebound off the keeper and netted from just outside the small square for Wexford. The goal was soon erased, Eoin Moriarty was on hand to double a rebound from a good save by keeper Dara O’Callaghan into the Wexford net. Tipp could have added to their tally, but efforts at goal, rather than taking the points, from close range frees went for naught, and Moloney put the last two over the bar to put Tipp into a 1-8 to 1-7 half time lead. Those frees were to prove costly in the end. The second half was just as close as the first. Tipp added to their lead soon after the restart with points from Moloney and Eoin Moriarty, however Wexford, who just introduced Brendan Phelan and Kieran O’Dea to the fray, opened up a chink of daylight between themselves and their opponents, although the game was always in the balance. The Wexford back line did a good job absorbing balls played into their direction, and with a lot of scoring options in their forward line looked like they may just hold the slight edge in the end. It was a Jamie Keogh goal half way in that set the platform. Keogh’s low shot slipped under James Maher and into the net, turning a 2 point Tipp lead into a one point Wexford advantage. Conor Sheehan and O’Dea added points and a goal stood between the sides and Wexford now had a lead to work with. Tipperary managed to level matters with a Sean Delaney drive into the back of the net, but it was immediately canceled out by a goal strike from substitute Michael Orpen, just 10 seconds between the scores. Wexford had added another point when Tipperary won a penalty after Sean Nally was pulled down, and it was dispatched with little fuss by Moloney. Wexford were hanging on to their lead and ended well with points from Sean Delaney and Sweatland to see themselves into the final against Fr. Tom Burke’s. Tipp: J. Maher, S. McGarr, C. Neville, P. Moriarty, J. White, S. Fortune, C. Dempsey, S. Nally, M. Moriarty, L. Moloney, M. Kavanagh, S, Delaney, E. Moriarty. Wexford: D. O’Callaghan, J. McCarthy, D. Walsh, G. Lundy, T. Moloney, S. Ryan, J. Kehoe, E. Flaherty, D. Sweatland, E. Kavanagh, R. Sludds, D. Binden, K. Joyce. The ladies footballers had their first outing of the season with Boston Shamrocks and Connacht Ladies taking the field on a wet, drizzly afternoon to decide who would take the Orla Benson Cup. The game was evenly contested with Jane Ward leading the way for Connacht Ladies and for the Shamrocks it was Mairead O’Driscoll the playmaker. With the game tied half way into the second half, the Shamrocks hit with two quick goals to effectively decide the contest. The teams were all square at the end of the first half. The Shamrocks got off to the early lead courtesy of a Mairead O’Driscoll goal from a penalty. O’Driscoll was adjudged to have been shoved from behind in the box, and the center forward put the ball away herself. Jane Ward had pointed for Connacht Ladies with a well taken effort, and was followed by Jackie McDonagh who finished a nice move. The game moved from end to end with the defences largely holding the upper hand, however, as things moved on, each side started to find a groove. O’Driscoll put back to back efforts over the bar to restore the Shamrocks lead, but just before the break the sides were level. Ward pumped a free from about 40 yards into the box and the ball found its way into the back of the Shamrocks net. A goal and two each at the break. Jane Ward and Cathy McEleaney tangle. The teams traded two points each to get the second half off the mark, Ward and Catherine Boyle for Connacht Ladies and O’Driscoll and Maebh Barry for the Shamrocks. The Shamrocks then hit with 2 goals in quick succession. The first was a result of Ciara Murphy and Elaine McLaughlin combining well. McLaughlin broke through the last line of defence and hit the back of the net with her shot. Murphy worked hard to block a clearance for the second goal and fed Louise Larkin who finished well. Now in the drivers seat the Shamrocks turned it up a notch. The half back line mopped up well, with Ann Marie McDonnell working hard, and O’Driscoll was to be found also helping in defence. O’Driscoll made it a three score difference with a calmly taken point and time was running out on Connacht Ladies. The Orla Benson Cup is played in memory of Orla Benson, an Irish student visiting Boston for the summer, who was brutally murdered in 1995. Connacht Ladies: J. Moen, J. McDonagh, A. Kerr, O. McDonagh, K. Kenneally, J. Ward, A. Corrigan, E. Kelly, M. Meehan, M. Mullen, I. Green, C. Boyle, A. Feeney. Boston Shamrocks: E. Kerin, S. O’Dowd, B. Maguire, L. Larkin, M. Collins, E. McLaughlin, C. McEleaney, L. McCrystal, A. McDonnell, M. O’Driscoll, M. Barry, C. Murphy, V. O’Brien.